Call the cops. Mike stole my heart! 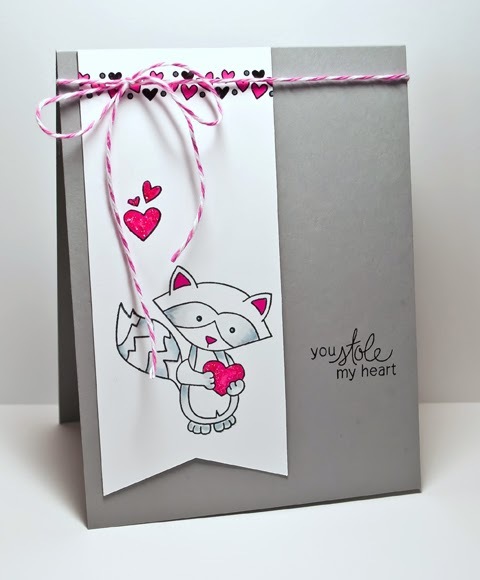 Is this little fox raccoon from Newton's Nook Design adorable? It's in a set called Sweetheart Tails. And the hearts are all glittery. Well, I thought it was an equally adorable raccoon, but 'raccoony' as mood when done definitely doesn't work as well! Whatever he is, he's very sweet! I love the little detail of the hearts under the twine! Adorable is right! And you colored him perfectly, Joan. Very cute and 'raccoony'! I love that layout and the sparkly heart. Oh my gosh, what a sweet little raccoon! Love the splash of hot pink. I will definitely have to check Newton's Nook - a new one for me. Adorable!!!! I have a pair of raccoons that have been trying to make my garage their winter home! Lol! 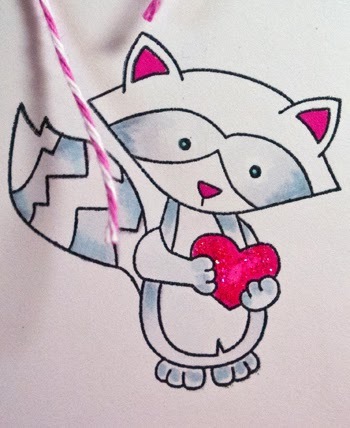 I agree - your Valentine raccoon is adorable! This is adorable!! I LOVE that little raccoon!! Eek--this is so darling. And, I am happy that I found you. I remember you stopped your blog. I guess you started a new one. Good for you, and hello. glad you found me (again!!). Hello back! That is just SO cute, Joan. Just as well DH doesn't do Valentine's so there's no point pining after a set I'd never use, LOL. Love this!! What grey card stock is that?? this is Stampin Up. I think it is basic gray, it came in a neutral assortment. thanks! This is adorable! LOVE your card!